Tete De Cuvee means the best of the vintage. This wine was born through Bill and Dan's love of the great Burgundies and their desire to make the best Burgundian style Pinot Noir in Australia. This wine is not a reserve wine made in the usual method of selecting the best barrels for separate bottling. Instead, a portion of the vineyard receives more vigorous crop-thinning and leaf plucking, and the wine from these grapes is made with greater emphasis on structure and ageing potential. As with the Picardy Pinot Noir, this wine is made from 5 clones. Like great Burgundies, is minimally cropped at 5 tonnes per hectare (35 hectolitres per hectare) and has all of the leaves hand plucked from the fruiting zone. Bill and Dan believe that the great wines from Burgundy have fruit flavours at the lower end of the ripeness spectrum on the back palate, giving them length and complexity. Therefore, the fruit for this wine is picked less mature. This wine is not a reserve wine made in the traditional method of selecting the best barrels for separate bottling. This would degrade the quality of the Picardy Pinot Noir. Instead a portion of the vineyard receives more ruthless crop thinning. It is also made with heavier emphasis on structure and cellaribility. To give this wine the huge structure and longevity which it has, it is cold macerated for longer periods, fermented with a higher portion of whole bunch fruit (to extract more tannin), fermented warmer for longer with a higher permanent skin contact area. It is then pressed harder to get more extraction. The resultant wine is then matured in new to four year old oak for 12 months. After barrel maturation it is given a very light filtration and bottled. It is then held in bottle until the Pannell Family feel that it is drinking at its optimum potential. 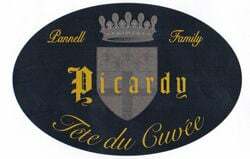 The Pannell Family are confident that the Picardy Tete de Cuvee will continue to drink superbly long after it has been released.